Wash and drain the Bhindi /Okra /Lady’s finger. Discard the crown of the lower ends of the ladyfingers and cut into large pieces. Peel, wash and chop the onions in to big quartered chunks, keep aside. Heat oil in a Kadhai/ wok and put cumin seeds. when the cumin seeds start crackling, add chopped onions to it. Fry the onions till transparent. Add Bhindi /Okra /Lady’s finger to the fried onions. Add salt, coriander powder, cumin powder, turmeric powder, and red chili powder, mix well. 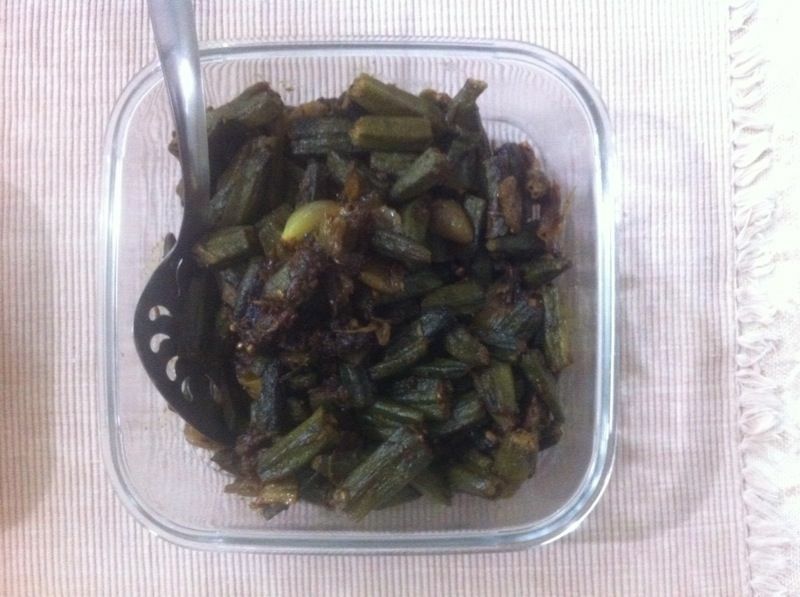 Cover with a lid and cook the Bhindi /Okra /Lady’s finger for 8-10 minutes on low flame. Serve hot. Helps control diabetes: Okra is packed with dietary fibre that helps stabilisation of blood sugar levels by regulation of the rate of absorption of sugar from the digestive tract. The anti-diabetic property of okra is also attributed to its ability of inhibition of enzymes metabolising carbohydrates, enhancement of production of insulin, regeneration of beta cell of the pancreas and increased secretion of insulin . It prevents heart disease: People are often affected with heart disease due to high levels of cholesterol in their blood. Pectin, a soluble fiber present in lady’s finger helps lower this cholesterol and thus is helpful in preventing heart disease. Okra is also fairly rich in antioxidant compounds like poly phenols. These compounds, especially quercetin, helps prevent oxidation of cholesterol and blocking of arteries, preventing heart disease development. It helps you lose weight: People who aspire to lose weight can eat lady’s finger to facilitate weight loss. The vegetable is extremely low in calories, with a 100g serving containing just 33 calories. Here are some other foods that can help you lose weight. It improves your immunity: Lady’s finger is rich in vitamin C with a 100g serving meeting approximately 38% of your daily requirement of the nutrient. Vitamin C is a vital nutrient that helps improves your immunity and protects you from several diseases and infections. Alternatively, you could also eat orange and amla to boost your vitamin C intake as both of them are extremely rich sources of the nutrient. It improves your mental function: Folate or Vitamin B9 is another critical nutrient present in lady’s finger. This nutrient is required by your brain to function properly as it aids in the production of several important compounds. It is good for pregnant women: Women who are pregnant will benefit from the consumption of lady’s finger as it contains Vitamin B9 or folic acid which can help prevent neurological birth defects in their newborn. It prevents cancer: According to a research published in Nutrition Journal, lady’s finger has a higher concentration of antioxidants than most vegetables. These antioxidants prevent damage to your cells from free radicals, and inhibit the growth of cancer cells in your body. Additionally, it contains some amount of insoluble fibre which promotes a healthy digestive tract and lowers your risk of colorectal cancer. Pectin present in the vegetable has been shown to prevent proliferation of melanoma cells in vitro .